Kids love to pretend that they work at a grocery store or restaurant, and this cute Pure Play Kids Wooden Cash Register will add to the fun. Sturdily built with wood, this cash register is kid-powered, battery-free and made to look and feel like the real deal to a young child. The cash register includes an educational 10-count abacus, an opening money drawer, a pretend credit card swipe and coin slots. 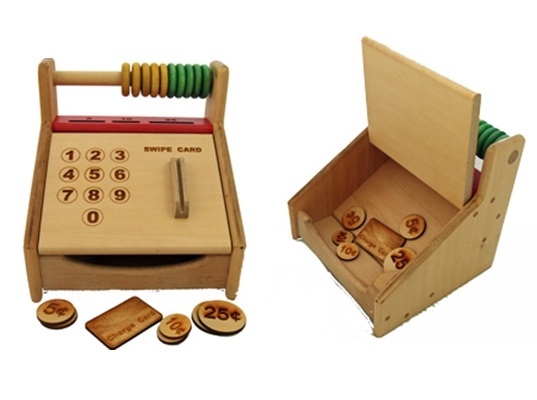 One wooden credit card and wooden coins are included. Even better, you can download fun paper currency at the Purely Playful Blog and then print it out on recycled paper for your child.